Internal Security Minister Gilad Erdan pledges security for Jewish families settling in eastern Jerusalem. 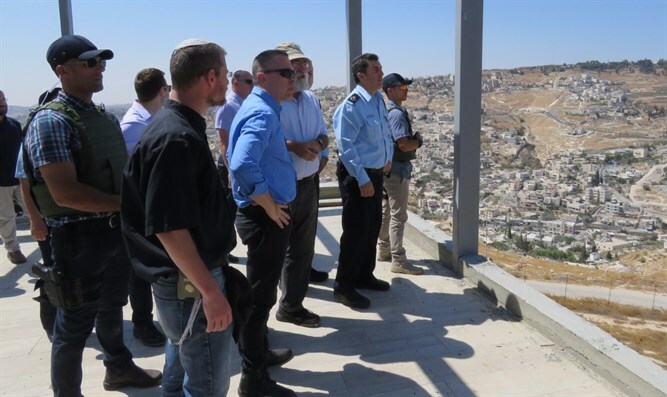 Internal Security Minister Gilad Erdan (Likud), and Jerusalem district police chief Yoram Halevy toured eastern Jerusalem on Sunday, including a number of Jewish neighborhoods in the area such as Maaleh Zeitim, Kidmat Tzion, and Kfar Shiloach (Silwan), formerly known as the Yemenite Village. During the tour, Erdan met with local Jewish residents and discussed with them the security challenges facing the Jewish communities in eastern Jerusalem, as well as possible ways to improve the situation. Residents of the Maaleh Zeitim neighborhood told the minister that they have noticed a dramatic decrease in the number of attacks and other security incidents in the area and increased calm following the addition of police units to neighborhood and the surrounding area. The tour comes as the Internal Security Minister pushes a 1.2 billion shekel ($335 million) plan to improve security in the capital. The plan includes the deployment of 1,250 more police officers to Jerusalem, increased wages for officers working in Jerusalem in order to attract and retain personnel, and the establishment of a central monitoring network linked into thousands of ‘smart cameras’ placed around the city. Joining Erdan and Halevy during the tour was Mati Dan, from the Ateret Cohanim foundation, which works to strengthen the Jewish presence in the capital by purchasing and refurbishing properties across eastern Jerusalem. The tour was capped off with a visit to the newly-renovated 19th century synagogue in the old Yemenite Village of Shiloach (Silwan). “Jewish settlement in eastern Jerusalem is taking place in the heart of biblical Jerusalem, overlooking the Temple Mount, the holiest place to the Jewish people,” said Erdan at the end of the tour. Erdan added that he would continue to work to ensure residents’ safety.